The easiest payment is through our Secure Server via Visa or MasterCard. You can also call us on 1300 920 219 or 07 3053 5768 to pay over the phone. Payment can be also made using your PayPal account. You can transfer payment directly into our bank account. We also accept personal and business cheques. 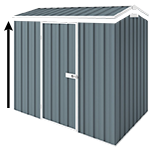 Please make the cheque payable to Cheap Sheds International Pty Ltd and post to PO Box 1581, Browns Plains 4118 QLD along with the details of your order and your contact details. Then you just need to confrim payment.